Diving the Opal Pool at Jawbone Flats is a unique experience for Oregon SCUBA divers. Opal Creek, a tributary of the Little North Fork of the Santiam River, is a gorgeous cascade of water and sparkling lush forest. The azure waters in the Opal Pool below Opal Pool Falls are inviting in the late summer or early fall. We have seen many people enjoying a swim here although the water can be chilly. The Opal Pool is a short walk up from Jawbone Flats where you can rent cabins. The main thing we like about this SCUBA dive site is the unique experience of going diving in a gorgeous pool tucked back into the forest far away from the nearest road. It is a unique and peaceful place to put on dive gear and take a dip. Underwater the basalt river rocks are mostly smooth and round. The walls of the pool are all basalt cliffs that add to the drama and beauty of this site. Someone with a very good camera and some time could make some awesome photos here combining the underwater and the above water beauty of the opal pool at Jawbone Flats. The nearest big city is Salem, Oregon. The tiny hamlet of Elkhorn is the first thing you will encounter driving down from the Opal Creek Trailhead. The bigger towns of Mehama and Lyons are a ways further down the road. 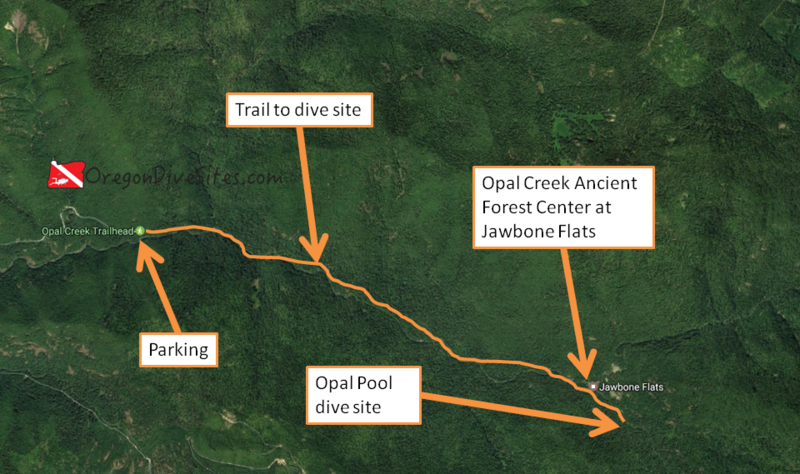 It takes some time to get to Jawbone Flats and the Opal Pool. First you need to drive to the Opal Creek Trailhead at the end of forest road NF-2209 out of Elkhorn, Oregon. Then you need to hike up to Jawbone Flats where the Opal Creek Ancient Forest Center is located. Then you take the trail toward Cedar Flats. Opal pool is below the bridge not far out of Jawbone Flats. The whole hike round trip is about seven miles. Carrying 100lbs of SCUBA gear on your back that distance is infeasible. There are a couple options though. You can try talking with the center at Jawbone Flats about having them use their shuttle to bring your gear up to the center and then walk the gear from there. You can convince a bunch of friends to help you carry in and out your SCUBA gear. You can also try using a wheeled cart although we aren’t sure if forest regulations allow that. We personally think staying at Jawbone Flats at the Opal Creek Ancient Forest Center overnight and coordinating with the center to bring your gear in and back out is the best option. You pay to park at the Opal Creek Trailhead. On popular weekends, the trailhead can be completely full of cars so plan ahead. The round trip hike to Opal Pool is a little over seven miles but we think the trip is well worth it for the unique diving experience. Once you have hiked up to Jawbone Flats and the Opal Creek Ancient Forest Center, take the trail toward Cedar Flats. Opal Pool isn’t too far away. Opal Pool is down in the creek bed. The site is so small and the water is so clear that you can’t really get lost here. Be mindful of other users of the pool. It’s a bit of a scramble down to the dive site from the trail but it is manageable. The rocks can be a bit slippery depending on conditions so watch your footing. During the summer and fall, the water is usually fairly calm although we have seen quite a few people swimming here on hot weekends. In the spring during the snow melt, this creek can turn into a raging torrent. During flood conditions, you will see why it is a bad idea to try diving the site! Visibility at Opal Pool is usually around 20-30 feet. You can see the bottom of the deepest part of the pool when you’re floating on the surface. Water temperature is influenced by recent storms, snow melt, and upstream spring volume. We have seen it between 40F and 60F depending on conditions although the deepest part of the pool is usually colder. 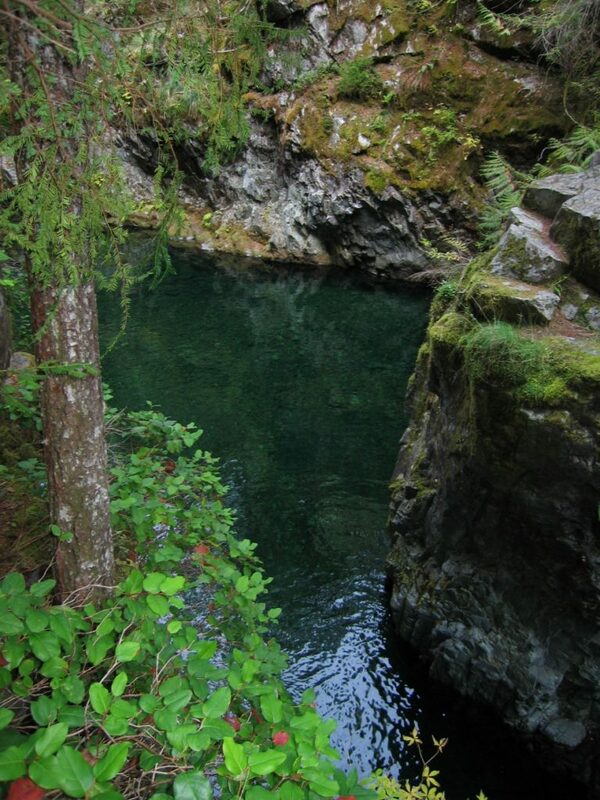 The best time of the year for making the trek to Jawbone Flats to dive Opal Creek is late summer or early fall. The water is warmer, the flow is lower, the days are warm, and it is less likely to be rainy and misty. We found 30 feet of water at one place in the pool. 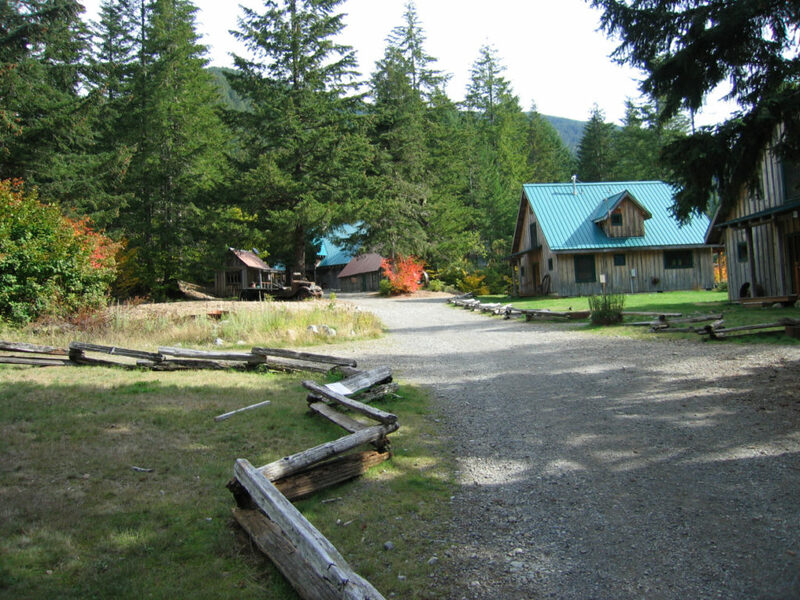 Opal Creek Ancient Forest Center at Jawbone Flats has cabins for rent and very limited food service. Both must be reserved weeks or months in advance. This is an altitude dive and you should have the training necessary for altitude diving. Open water divers can successfully dive this site although just getting to the site is challenging enough that we suggest open water divers go check out other more easily accessible sites. Down by Eugene there are some good dives that have similar pools to Opal Pool. We rate this as an intermediate dive because of the trek to get to the site and the bit of scramble necessary to get to the water. Also this is an altitude dive so diving around Jawbone Flats requires a little extra training. It’s about 3.5 miles from the parking lot at the trailhead all the way to the dive site. Yes, that’s a brutal hike wearing 100lbs of dive gear. Yes, it’s a bad idea to try to do it completely geared up unless you like heat stroke. No surface swims are needed at Opal Pool. We highly recommend contacting the Opal Creek Ancient Forest Center at Jawbone Flats several weeks or even several months in advance of your visit. While we have gone diving at this site before and know others who have done it, the staff at Jawbone Flats has changed since then. We view diving Opal Pool as a privilege rather than a right for SCUBA divers. Please be polite with the staff and gracious to your hosts. We suggest renting a cabin at the Center and asking the staff to transport your gear from your car to your cabin. They did it for us a number of years ago. It would be worthwhile to investigate what sorts of tasty beverages or recreational activities the staff at the Center enjoy and bringing some things up to share with them. The staff stays in at Jawbone Flats for days or weeks at a time and, at least the last time we were there, they enjoyed us bringing in things that they can’t usually get at Jawbone Flats. The closest dive shop is in Salem where air fills, gear service, and rental gear is available. However, this dive site is inaccessible enough that you need to bring everything with you and be fully self sufficient. The Opal Creek Ancient Forest Center does have very limited (but very good!) meal service. You MUST reserve your meals at least two weeks in advance (double check this because it might change!) so that they have enough food for you. There is usually NOT walk-up food service. If you aren’t having a meal or two at the Center, you need to bring in all of your own food. 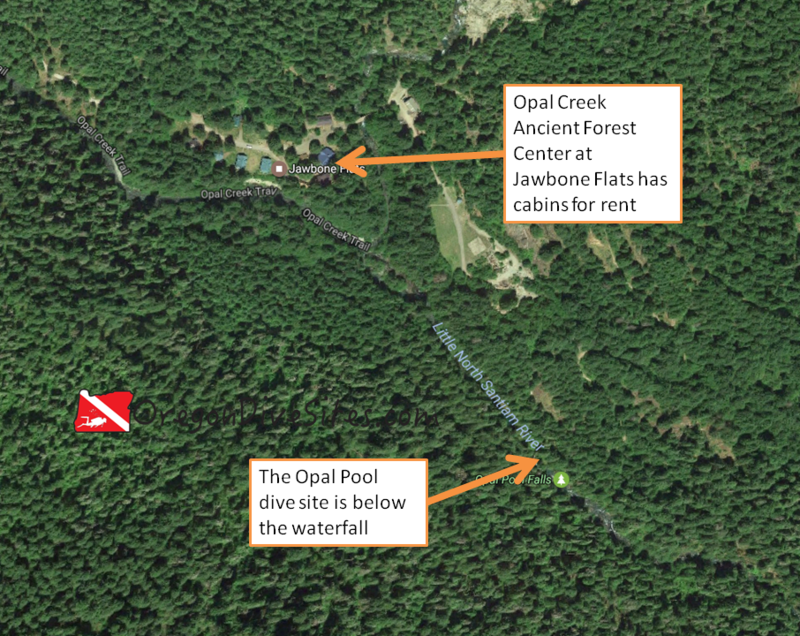 The Opal Creek Ancient Forest Center has cabins for rent. However, they are extremely popular and often booked out months in advance. You can camp in the forest but you must follow local wilderness regulations. This area gets a lot of use so check with the district ranger office well in advance of your trip to get the most up-to-date information on where you can camp. In addition to being against forest regulations to camp wherever you want, it is also very bad for the forest if you camp in places that you shouldn’t. The Opal Creek Wilderness is a special place in Oregon that as SCUBA divers we should work to protect so that we can continue enjoying Jawbone Flats and the Opal Pool for many years to come.